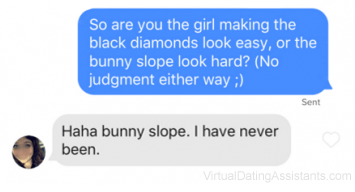 A quick Google search will reveal there are tons of guys who already know how difficult it can be to get a woman to reply to them, especially if she’s attractive. 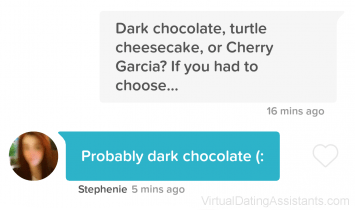 If you don’t know the best way to start an online dating conversation, it could take you awhile to get a response. In fact, statistics show you’ll need to a whopping 114 messages just to be 99% sure you’ll get one reply. But don’t worry – here at VIDA we’ve crafted thousands of messages and tracked their response rates, so we know what works and what doesn’t when it comes to sending messages that make her want to write you back. 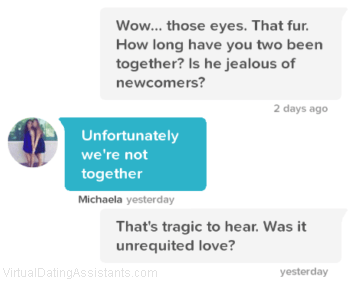 Get ready to take some notes, because we’re about to share everything you need to know about starting a conversation that will end with a date – including some great examples of online dating conversation starters! Once you’ve found someone that catches your eye, look through her photos (as if we had to tell you that). This is often the best place to figure out her personality, since her photos are an indication of how she wants to present herself. Next, skim through her profile. Try to pick up on what she is passionate about — she'll be more apt to respond if you ask her about something she’s interested in. Also take note of things you have in common. If you ask about something you are mutually interested in, you'll have a much easier time keeping the conversation flowing. PRO TIP: No time to read through the profiles of all the attractive women you want to message? Here’s a shortcut that will save you tons of time: use cut & paste messages that you can send any woman. Keep reading for some examples. Or take the most efficient route of all, and let us do it all for you. If you’re one of those guys who’s been leading with “Hey, baby” or “ur beautiful”, you already know that doesn’t work. Your message needs to grab her attention, pique her curiosity, and make her want to know more about you. You also want to make it easy for her to respond, and the best way to do that is to ask her a question. 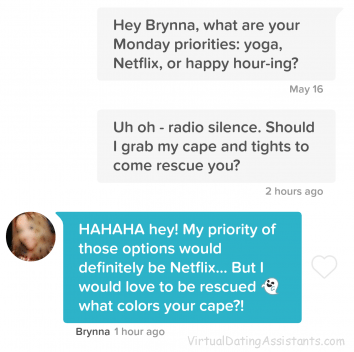 Make it easy for her to respond by asking a question in your message. Use proper grammar and correct spelling – you only get one first impression. Compliment her looks (that’s what all the other guys do, and it doesn’t work for them either). Write multiple paragraphs. She’s not going to read it, and you don’t want to look like you’re trying too hard to impress her. 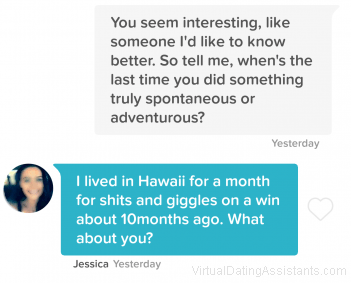 Ask her out in the first message, she wants to get to know you before meeting you in person. What if, despite your best efforts, she doesn’t respond to your icebreaker message? Don’t worry – it happens. Maybe she’s busy. Maybe she forgot, or she’s out of town. If she doesn’t respond to that one either, let it go. You don’t want to look like a stalker, and besides – there’s plenty more fish in the sea. Comment on her answer to the question you asked. Answer it yourself so she learns something about you as well. Use every message as an opportunity to highlight your positive qualities and traits – the whole point of an online dating conversation is to build attraction. For instance, if she asks you about your plans for the weekend, you could mention how you’re planning to take your dog on a hike, take your nephew to a ballgame, then meet some friends for a concert. In just one sentence you’ve communicated that you’re responsible enough to have a pet, you’re active, you’re family oriented, and you’ve got a social life – all attractive qualities. But how many messages should you exchange before you ask her out? You don’t want to pressure her or scare her off by asking too soon, but you don’t want her to lose interest by taking too long. After all, she’s not on Match.com to find a new pen pal! Luckily for you, our team of online dating experts reviewed thousands of online dating conversations that resulted in dates for our male clients. After examining the data, we learned the best time to ask for the date is after she’s sent you 2 or 3 messages. Never just suggest meeting for drinks – doing that will torpedo your chances of success. For even more essential tips on how to ask a girl out online, click here. Don't want to leave anything to chance? Have the dating experts at VIDA handle all the messaging for you! (And everything else, too!) Get more details here.